For the former president of Paramount Vantage, see Nick Meyer. 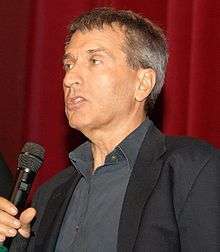 Nicholas Meyer (born December 24, 1945) is an American screenwriter, producer, author and director, most known for his best-selling novel The Seven-Per-Cent Solution, and for directing the films Time After Time, two of the Star Trek feature film series, and the 1983 television movie The Day After. For adapting a screenplay from his own novel for The Seven-Per-Cent Solution (1976), Meyer was nominated for an Academy Award for Best Adapted Screenplay. He has also been nominated for a Satellite Award, three Emmy Awards, and has won four Saturn Awards. Meyer was born in New York City, New York, to a Jewish family. He is the son of Elly (Kassman), a concert pianist, and Bernard Constant Meyer, a Manhattan psychoanalyst. Meyer graduated from the University of Iowa with a degree in theater and filmmaking, and also wrote film reviews for the campus newspaper. Meyer first gained public attention for his best-selling 1974 Sherlock Holmes novel The Seven-Per-Cent Solution, a story of Holmes confronting his cocaine addiction with the help of Sigmund Freud. Meyer followed this with two additional Holmes novels: The West End Horror (1976), and The Canary Trainer (1993). The Seven-Per-Cent Solution was later adapted as a 1976 film of the same name, for which Meyer wrote the screenplay. The film was directed by Herbert Ross and starred Nicol Williamson, Robert Duvall, Alan Arkin and Laurence Olivier. For his work adapting the novel, Meyer was nominated for an Academy Award for Best Adapted Screenplay at the 49th Academy Awards. Intrigued by the first part of college friend Karl Alexander's then-incomplete novel Time After Time, Meyer optioned the book and adapted it into a screenplay. He consented to sell the script only if he were attached as director. The deal was optioned by Warner Bros., and the film became Meyer's directorial debut. Meyer freely allowed Alexander to borrow from the screenplay. The latter published his novel at about the same time the movie was released. Time After Time (1979) starred Malcolm McDowell, Mary Steenburgen and David Warner. It was a critical and commercial success. At the behest of then Paramount executive Karen Moore, Meyer was hired to direct Star Trek II: The Wrath of Khan. Meyer later directed the 1983 television film The Day After, starring Jason Robards, JoBeth Williams, John Cullum, Bibi Besch, John Lithgow and Steve Guttenberg, which depicted the ramifications of a nuclear attack on the United States. Meyer had originally decided not to do any television work, but changed his mind upon reading the script by Edward Hume. For his work on The Day After, Meyer was nominated for an Emmy Award for Best Director. Afterward, he also directed "The Pied Piper of Hamelin", a 1985 episode of the television series Shelley Duvall's Faerie Tale Theatre. He resumed directing theatrical films with the 1985 comedy Volunteers, starring Tom Hanks and John Candy. After directing Volunteers, Meyer returned to working on Star Trek, co-writing the screenplay for Star Trek IV: The Voyage Home (1986) with producer Harve Bennett. Meyer's next directing job was the 1988 Merchant Ivory produced drama The Deceivers, with Pierce Brosnan as British officer William Savage. Meyer later wrote and directed the 1991 spy comedy Company Business, starring Gene Hackman and Mikhail Baryshnikov as aging American and Russian secret agents. In 1991, Meyer once again returned to the world of Star Trek, co-writing and directing Star Trek VI: The Undiscovered Country, which became a swan song for the original cast. Meyer performed uncredited rewrites on an early draft of the screenplay of the 1997 James Bond film Tomorrow Never Dies. Meyer adapted the Philip Roth novel The Human Stain into the 2003 film of the same name. In 2006, he teamed with Martin Scorsese to write the screenplay for Scorsese's adaptation of Edmund Morris's Pulitzer Prize winning biography of Theodore Roosevelt, The Rise of Theodore Roosevelt. The story traces Roosevelt's early life. Meyer, along with writer/producer Harve Bennett, is one of two people credited with revitalizing and perhaps saving the Star Trek franchise after the problems of the first film, Star Trek: The Motion Picture, almost caused Paramount Pictures to end the series. Paramount had been unhappy with the creative direction of the first film, as well as the cost overruns and production problems. However, the film was also a great financial success, and they wanted a sequel. Bennett, a reliable television producer, was hired to help. Introduced to Bennett by Paramount executive Karen Moore, Meyer was hired as a potential director for Star Trek II: The Wrath of Khan despite never having seen the first film. :96 Due to problems with the early drafts of the script, which most readers disliked, Meyer quickly became involved in re-writing the film's screenplay. After meeting with Bennett and other members of the cast and crew regarding the script, Meyer impressed Star Trek's actors and producers by delivering a superior draft of the script in only twelve days. The draft had to be completed so quickly, in fact, that Meyer agreed to forgo the negotiation of a contract or credit for his writing in order to begin work on the script immediately. As a result, he is uncredited as a writer on the final film. In his direction, Meyer made stylistic alterations, such as adding more of a naval appearance. Meyer and Bennett together created a film that was engaging while also reducing costs and avoiding the production fiascoes of the first Star Trek film. The Wrath of Khan became a financial success, grossing $78 million in the domestic market, and is considered by many to be the best Star Trek film to date. Although he "refuse[d] to specialize" and so vowed to not work on another Star Trek project, Meyer co-wrote the screenplay for the fourth Star Trek film, Star Trek IV: The Voyage Home with Bennett. For that film, Bennett wrote the first and third acts, which occur in the 23rd century, and Meyer wrote the second act, which occurs in 1986 San Francisco. Meyer has said that one of the most enjoyable aspects of working on this film was getting the chance to re-use elements which he had been forced to discard from his earlier film, Time After Time. Star Trek IV proved to be successful financially, notable for succeeding with general moviegoers as well as science fiction and Star Trek devotees. Meyer worked for the Star Trek franchise again for the sixth film in the series, Star Trek VI: The Undiscovered Country (1991). He developed the story with Leonard Nimoy and co-wrote the screenplay with long-time friend and assistant Denny Flinn. He directed the picture, which was the final film to feature the entire classic Star Trek cast. Like its predecessors, this film was successful financially, grossing $74 million in the domestic market. Many of Meyer's personal papers from his involvement with the Star Trek franchise are housed at the University of Iowa Libraries. In February 2016, it was announced that Meyer would be returning to Star Trek by joining the writing team for CBS's new TV series, Star Trek: Discovery, set to premier in January 2017. The premiere was subsequently moved to May 2017. 1985 Faerie Tale Theatre Director/Writer (screenplay) TV series, episode "The Pied Piper of Hamelin"
1976 The West End Horror The New York Times Best Seller list. ↑ "Nicholas Meyer Biography (1945-)". filmreference.com. Retrieved 10 March 2016. ↑ "Time After Time". Rotten Tomatoes. Flixster. Retrieved 2 September 2011. ↑ Meyer, Nicholas (2009). The View From the Bridge: Memories of Star Trek and a Life in Hollywood. NY: Viking. pp. 72–73. ISBN 978-0-670-02130-7. ↑ ISBNdb.com. "Bibliography of Meyer, Nicholas, alphabetically ordered". Retrieved 5 February 2010. 1 2 Rex Weiner and Adam Dawtrey. "Latest Bond Production Shaken, Stirred". Retrieved 1 October 2012. Online copy of news article originally published in Variety (8–15 December 1996). ↑ Dillard, J.M. (1994). Star Trek: "Where No Man Has Gone Before" — A History in Pictures. Pocket Books. ISBN 0-671-51149-1. ↑ "Star Trek II: The Wrath of Khan". Rotten Tomatoes. Retrieved 2 September 2011. ↑ Anderson, Nancy (1982-07-04). "Trekkies wrath worse than Khan's". Newburgh Evening News. Copley News Service. pp. 14E. Retrieved 3 May 2011. ↑ "Star Trek Movies at the Box Office - Box Office Mojo". boxofficemojo.com. Retrieved 10 March 2016. ↑ "Star Trek VI: The Undiscovered Country (1991) - Box office / business". imdb.com. Retrieved 10 March 2016. ↑ "Papers of Nicholas Meyer - The University of Iowa Libraries". www.lib.uiowa.edu. Retrieved 7 October 2015. ↑ "'Star Trek': Nicholas Meyer Joins CBS Series as Writer-Producer - Hollywood Reporter". hollywoodreporter.com. Retrieved 10 March 2016. ↑ Meyer, Nicholas (2009). The View from the Bridge: Memories of Star Trek and a Life in Hollywood. Penguin Books. ISBN 9781101133477. ↑ Adult New York Times Best Seller Lists for 1974. Retrieved 23 December 2012. ↑ Adult New York Times Best Seller Lists for 1975. Retrieved 23 December 2012. ↑ Adult New York Times Best Seller Lists for 1976. Retrieved 23 December 2012.